Dru Melvin of Ponca City, Okla., lowers himself on his steer Wednesday morning during his bulldogging run at Dodge City Roundup Rodeo. Melvin leads the second go-round with a 4.2-second run, but he suffered a no-time in the first round. 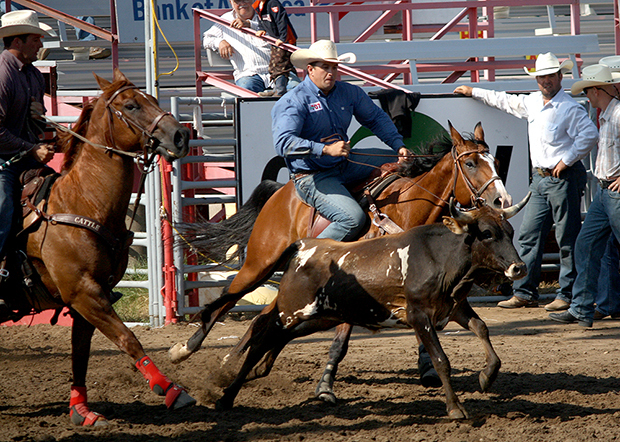 Melvin qualified for the Wrangler National Finals Rodeo in 2006. The first-round of competition for Wednesday’s section of Dodge City Roundup Rodeo timed events is complete, and the second round is partially complete. I have posted updated photos HERE. Steer wrestling: First round leaders: 1. Casey Martin, 4.2 seconds; 2. Ty Willick, 4.5; 3. Bray Armes, 4.6; 4. Jacob Shofner, 5.0; 5. Cooper Shofner, 5.3; 6. Kyle Broce, 5.8; 7. Dakota Eldridge, 5.9; 8. Ben Shofner, 6.0. Second round leaders: 1. Dru Melvin, 4.2 seconds; 2. Blake Knowles, 4.9; 3. Joe Buffington, 5.6; 4. Kody Dollery, 6.0; 5. Sean Mulligan, 6.8; 6. Gabe Burrows, 8.4; 7. (tie) Sterling Lambert and Kyle Whitaker, 10.9. Average leaders: 1. Joe Buffington, 12.0 on two runs; 2. Sean Mulligan, 13.0; 3. Tait Kvistad, 21.9; 4. Sterling Lambert, 22.6; 5. Kyle Whitaker, 24.9; 6. Blake Knowles, 26.8; 7. Jarret New, 21.4; 8. (tie) Casey Martin and Dru Melvin, 4.2 on one. Team roping: First round leaders: 1. Clay Smith/Jake Smith, 5.7 seconds; no other qualified times. Second round leaders: No times yet. Tie-down roping: First round leaders: 1. Ben Madsen, 9.4 seconds; 2. Blake Deckard, 11.0; 3. Colby Dorsey, 14.1; 4. Tylen Layton, 15.9; 5. Fred Whitfield, 18.8; 6. Luke Madsen, 21.6; no other qualified times. Second round leaders: no qualified times. Average leaders: no qualified times. Barrel racing: First round leaders: 1. Kelly Waide, 17.34 seconds; 2. (tie) Morgan Figueroa and Carol Chesher, 17.35; 4. Shannon Witcher, 17.45; 5. Lizzy Ehr, 17.48; 6. Ryann Pedone, 17.57; 7. Gretchen Benbenek, 17.60; 8. Katharine Wall, 17.79. Second round leaders: 1. Emily Miller, 17.24 seconds; 2. Sandy McElreath, 17.38; 3. Benette Little, 17.47; 4. Stacey Bailey, 17.63; 5. Kirby Harter, 17.69; 6. Debbie Bloxom, 22.85; 7. Tana Poppino, 22.97; 8. Shanda Suit, 25.94. Average leaders: 1. Sandy McElreath, 35.34 seconds on two runs; 2. Kirby Harter, 35.82; 3. Stacey Bailey, 40.05; 4. Benette Little, 40.21; 5. Shanda Suit, 45.07; 6. Tana Poppino, 46.10; 7. Debbie Bloxom, 46.12; 8. Sherri Lucas, 46.20.